Dear MEPs: We need you to protect our privacy online! They’re hip, they’re slick and they follow you everywhere. They know you like new shoes, playing tennis and tweeting at odd hours of the morning. Do you know what that says about your health, your relationships and your spending power? No? Well, the online companies do. 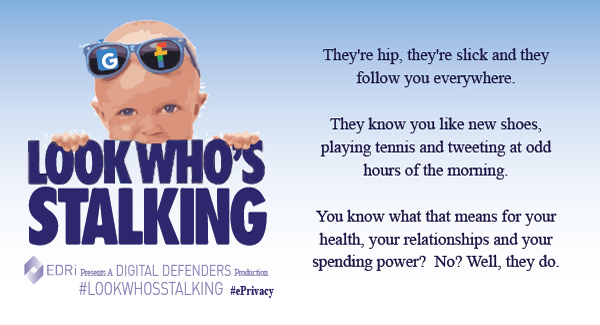 They follow you everywhere you go online, they have a perfect memory, they know the sites you visited last year even if you’ve forgotten… Look who’s stalking. European legislation protecting your personal data was updated in 2016, but the battle to keep it safe is not over yet. The European Union is revising its e-Privacy rules. We welcomed the European Commission (EC) proposal as a good starting point, but with room for improvement. The online tracking industry is lobbying fiercely against it. Online tracking and profiling gave us filter bubbles and echo chambers. Yet the lobbyists lobby for it under the pretext of “saving the internet”, “protecting quality journalism” – even “saving democracy”. The European Parliament is currently debating its position on the EC proposal. Some Members of the European Parliament (MEPs) support “tracking business, as usual” while others support a strong future-proof norm to protect the privacy, innovation and security of future generations of EU citizens and businesses. 1) Protect confidentiality of our communications – both in transit and at rest! 2) Protect our privacy: Do not add loopholes to security measures! 3) Do not let anyone use our data without asking for our consent! 4) Privacy should not be an option – what we need is privacy by default! 5) No new exceptions to undermine our privacy! 6) Do not undermine encryption! Imposing a ban on undermining or attacking encryption should be a priority. 7) Protect our devices (hardware+software) by design and by default! Hardware and software security need to be protected by design and by default. MEPs, protect our #ePrivacy – Support amendments that follow the principles listed above! ePrivacy Regulation: Call a representative and make your voice heard!